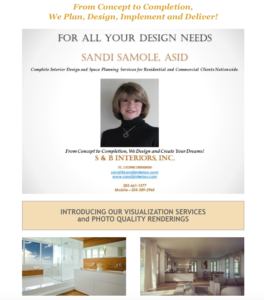 S & B Interiors, Inc. Is here for all your Design Needs! - S & B Interiors, Inc.
S & B Interiors, Inc. Is here for all your Design Needs! Using an Interior Designer is more then just hiring someone to pick pretty fabrics or the correct color of paint. Hiring an Interior Designer is having a professional on your “team” while you are making decisions for your home or office. From Concept to Completion, we work with you to be sure that utilization of space is optimized, products selected are fit for the purpose intended and the best options are selected. ← Preview your remodeling project with a rendering!